Big Star is one of those bands that prove that life isn’t fair. We like to tell ourselves, especially here in the United States, that the cream always rises to the top. The deck may not always be stacked in our favor, but with a little hard work and talent you’ll always succeed. Wrong. Sometimes the best and brightest, the most talented people on the planet are ignored. When this happens we search for a reason, a why that fits with our grand vision of an inherently fair universe. English rockers XTC are a good example. They didn’t get famous because their lead singer developed crippling stage anxiety, right? Well that didn’t stop Brian Wilson, who stuck to the studio and still managed to find success. The truth is not everyone with big talent winds up a big star. I happened upon Big Star the way most people do: by reading album reviews. Once I got into indie bands, I started reading reviews in which critics compared bands to The Beatles and Big Star, always it seemed it was those two bands. The first band I knew pretty well and so I was able to make the connection the critical shorthand was conveying. But what the heck was Big Star? Bands that I thought sounded a bit like Cheap Trick were often said to be “Big Star-ish.” At a certain point, I got tired of being out of the loop and I ordered a copy of #1 ALBUM/RADIO CITY. That this disc was actually a bastardization of two albums was something I only learned later. By fusing the band’s first two albums together, Big Star’s current corporate owners created the single greatest dollar-per-song ratio of any album I’ve ever purchased. For video game fans, #1 ALBUM/RADIO CITY is the musical equivalent of Valve’s Orange Box. The damn thing is basically a Greatest Hits record. Except, there were no hits. I didn’t understand what happened, or why, until I sat down and watched Drew DeNicola’s documentary NOTHING CAN HURT ME. The answers aren’t as simple as the band didn’t sell albums because “X” happened. The band formed in Memphis, Tennessee in the early 1970’s and got hooked up with the floundering STAX records. Known more for soul/R&B music, STAX and its demise are a large part of the reason Big Star remained unknown for so very long. But just blaming a label is an oversimplification. The truth, which NOTHING CAN HURT ME explores, is more complex. Lead singer Alex Chilton and singer/guitarist Chris Bell formed a fragile, Lennon-McCartney relationship that produced the confidently-titled #1 RECORD. The album failed to connect with rock fans despite a frustratingly large amount of critical acclaim. Dejected, Bell left the band and sort of lost his mind. This is where Big Star started to fall apart. A second album RADIO CITY, was produced, and was met with even greater critical acclaim and even less commercial success. Part of the album’s failure certainly had to do with the aforementioned STAX going belly-up after years of mis-management. NOTHING CAN HURT ME follows Chilton and Bell as they spend the rest of their post RADIO CITY-lives in a stunned dazed wondering how had something so good gone unrecognized? Bell winds up working at a fast food restaurant where fans eventually find him and track him down. Chilton, who stayed in the public eye by remaining in music, became the target of ire because he chose to step away from the power-pop of Big Star and record avante-garde punk. The film does a good job of charting the band’s rise. In fact, it does such a good job that when the band’s albums fail to make an impact I found myself a little surprised, even though I knew the band’s history. I also appreciated the interviews with Bell’s sister near the end, who is both bitter about how the music industry had so deeply hurt her brother and amazed that fans now make pilgrimages to his old home. There were very few startling revelations in the film, with one notable exception. As someone that got on the Big Star bandwagon very late (but then again, aren’t we all?) I was shocked to learn that Big Star was really Bell’s band and not Chilton’s. Listening to Bell’s posthumously released solo album, I AM THE COSMOS (which I hadn’t even known existed), it becomes apparent where the bulk of the Big Star magic originated. NOTHING CAN HURT ME while worth watching, isn’t perfect. The documentary doesn’t feature any interviews with either Bell or Chilton because, sadly, they’re both dead. Bell died tragically at age 27 and Chilton a few years before the 2012 documentary was shot. Their absence from the film is glaring and the unfortunate result of the band’s delayed fame. Another glaring omission, in my opinion, is a proper explanation of Big Star’s legend and how the band’s cult following grew over the years. This should be the heart of the documentary but instead is glossed over. I’d have liked for NOTHING CAN HURT ME to show me how this obscure Memphis band appreciated over time until I had no choice but to seek out their albums just so I’d know what everyone was talking about. Alas, the documentary choses to focus on the sad trajectory of Chris Bell’s life rather than explore how Big Star got so much underground notoriety. 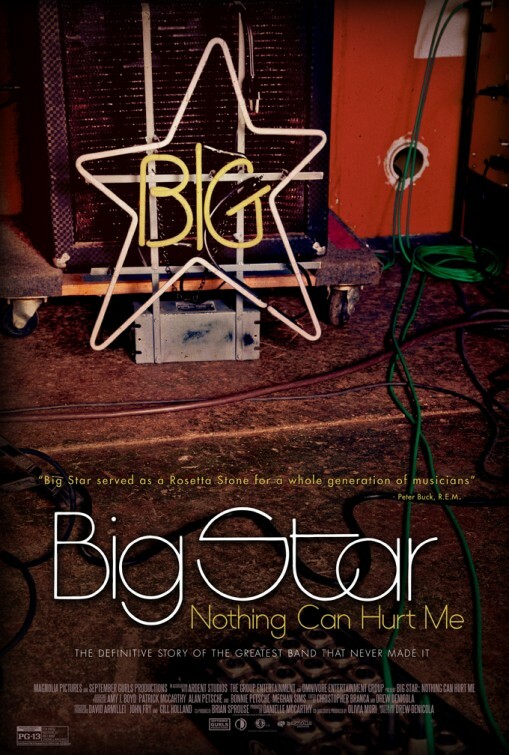 Overall, I enjoyed NOTHING CAN HURT ME, but I still feel like there’s a better Big Star documentary out there somewhere. Or at least, one that’s a more definitive look at the band’s life and resurrection. Of course, without Bell and Chilton, that’s probably not true. I’d recommend the film, but only after you’ve listened to #1 RECORD and RADIO CITY a few times. NOTHING CAN HURT ME is available now on Netflix’s US instant-streaming service.